India has this equally fascinating neighbour in Sri Lanka. Culturally and historically, Sri Lanka is blessed with a wealth of native as well as colonial impressions all over. 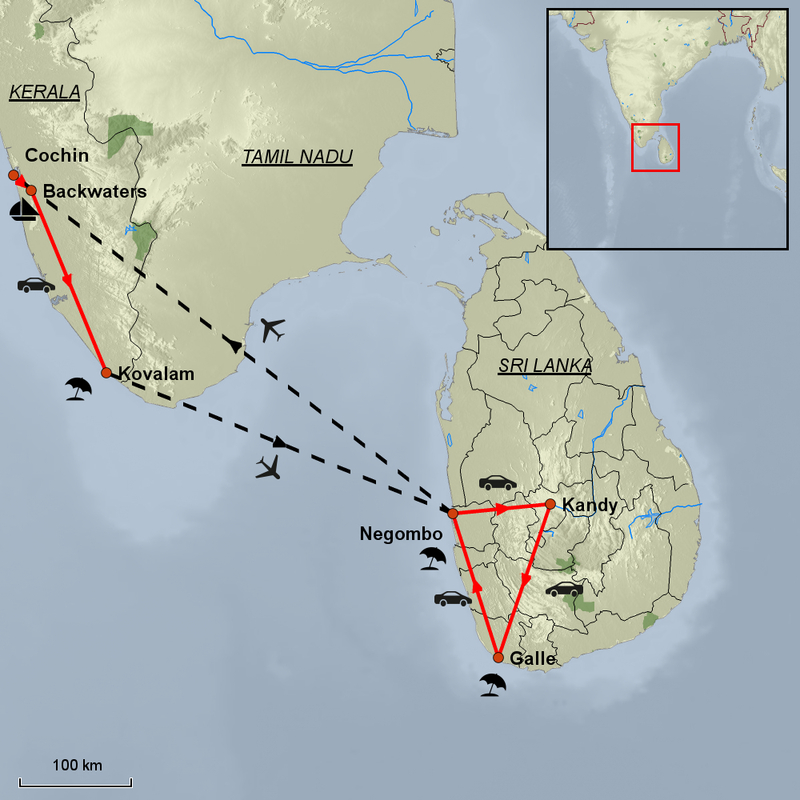 To club Sri Lanka with Kerala, which is a unique destination in itself sounds like an interesting idea? 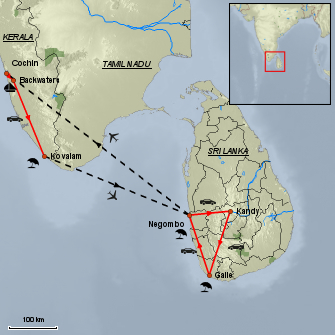 Negombo in Sri Lanka is the best way to begin exploring this fabulous country. It has the first beach resort developed in this beautiful land. Just 15kms away from the airport, the city was once the cinnamon port of the country – primarily a fisherman’s abode and a sea foodie’s paradise. Negombo still has the old fishing techniques, which are an unusual sight. The catamarans the fishing nets are happy impressions of the times when the Dutch, the Portuguese later and then the British ruled this part too. It is a place worth discovering through its canals that are picturesquely connected to the lagoon. 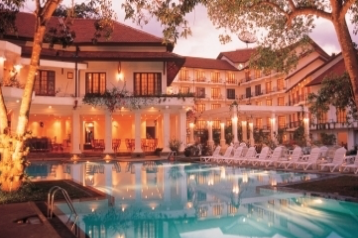 Further ahead the tour takes you to Kandy, which is the most sacred city of Sri Lanka. 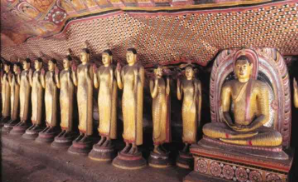 It is world famous for the sacred Tooth Relic of Lord Buddha. The colorful pageant that venerates the Tooth Relic once a year is a great spectacle. The Sri Lankan journey continues with Galle, which is a spectacular sample of a fortified city built by the Europeans built in Asia. Galle also has the Maritime Museum and Shiva Temple worth a visit. This lovely journey then brings you to the backwaters, houseboats and the coconut grove experience to Kerala. That makes this tour all the more interesting and adds a different charm to it. The kettuvellums and the serene rivers along with tranquillity do not let you feel the change in the national boundaries. After exploring Kochi and Kovalam beaches along with the churches and the temples, one feels rejuvenated when one returns to Negombo again!! NEGOMBO: Sri Lanka – Negombo located on the western coast is a great place to start or end your stay in Sri Lanka, being close to the airport. Enjoy local Sri Lankan food, where seafood is very popular being caught daily by the local Negombo fishermen. Enjoy a walk the long stretch of beach or just relax beachside, waiting for that perfect sunset. 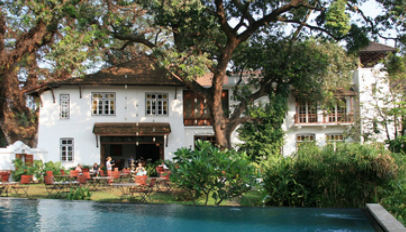 KANDY: Sri Lanka – The Hill Capital of Kandy was the last bastion of the Sinhala kings and is a charming city offering a living record of a magnificent past. Centre of attraction in Kandy isWhile here you will visit the Dalada Maligawa, the temple housing the sacred Tooth Relic of the Buddha. GALLE: Sri Lanka -Dutch Fort at Galle, close to the island’s southernmost point, 173km from Colombo, has the distinction of being the best-preserved sea fort in South Asia. A living heritage site, this 90 hectare (222 acres) attraction is a superb blend of architecture, with fortifications that resemble those in the coastal areas of Portugal. 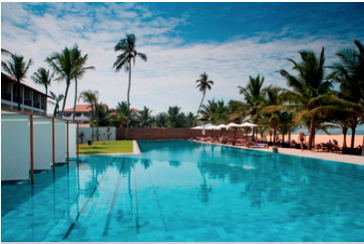 KOVALAM: India – Kovalam, an uncluttered beach of silvery sands fringed with rows of tall palm trees. Once just a series of sandy bays separated by rocky promontories, deserted except for some fishing villages, it has become a major tourist centre. Kovalam is a pleasant seaside place with a sheltered bay and a wide choice of water sports. Thank you for designing our tour to Kerala and Sri Lanka, the transition and services in both countries were seamless. We would especially like to highlight our driver and guide in Sri Lanka; Sanjaya was a gentleman who was full of knowledge not only in the major sightseeing areas but throughout the whole journey. After breakfast, drive to Kandy visiting Pinnawala Elephant Orphanage en route. After breakfast, visit Peradeniya Royal Botanical Garden. Rest of the day is at leisure for Independent activities. After breakfast drive to Galle en route with a visit to Galle Dutch Fort on arrival. After breakfast, a day excursion to Balapitiya where you will take an exciting boat safari among the mangrove on the Madhu River. Afterward, visit a turtle hatchery. Breakfast is at your Hotel. After breakfast drive to Colombo and board flight to Cochin. 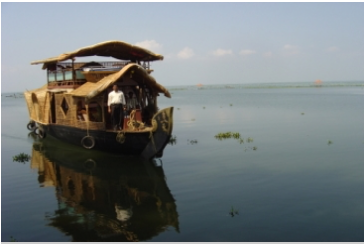 Drive to Alleppey and board the Rice Barge Houseboat. The backwaters a myriad network of canals and lagoons, at times only a few yards inland from the sea, and stretching for miles. These freshwater waterways wind their way through the tropical jungles of palms and fruit trees, vibrant green paddy fields and small, water based settlements. A day at leisure to relax or explore the beach. Drive to Trivandrum airport to board the flight to Colombo. Arrive Colombo and drive to Negombo. After breakfast, city tour of Colombo. Later return to your hotel then the rest of the day is at leisure to relax. Today Srilanka bids you farewell with your transfer to the international terminal. 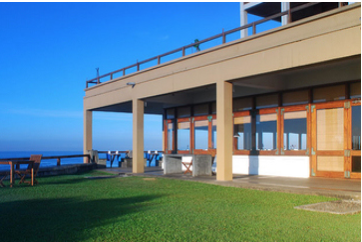 Jetwing Blue, Negombo, a stylish beach hotel which redefines the ultimate beach holiday experience. Warm Sri Lankan hospitality combined with contemporary comforts and excellent service is yours to enjoy as you enter this world of secluded bliss. On the famed southwestern coast of Sri Lanka, in the ancient Dutch outpost of Galle, hotels line the shore and are many and varied. But amongst them all, one stands out – distinctive as a beacon of light in the dark; and named likewise. Known and loved the world over, Jetwing Lighthouse, Galle, embraces a rugged outcrop along the coastline just before the city centre and is the last unique architectural triumph of Sri Lanka’s iconic genius, Geoffrey Bawa. A the living expression of Kerala’s ancient and vibrant civilisation. 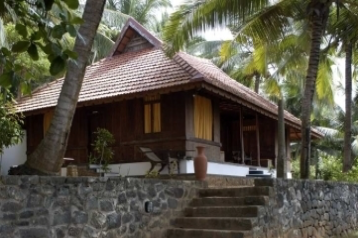 Spread over lush green acres of landscaped tropical gardens and insulated from the busy tourist seaside, this tranquil paradise sits on top of a cliff overlooking pristine beaches by the Arabian Sea in Kerala – God’s Own Country. After Kandy, before Galle stay in the Tea Plantation region of Hatton. 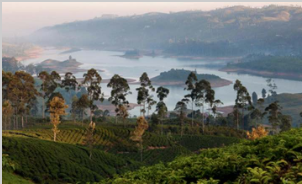 Hatton serves as a gateway to Adam’s Peak and Sinjaraja Forest Reserve and is better known for its tea plantations and industry. Include Dambulla in your tour, 3 hours drive from Kandy. The Rock Temple is a magnificent gallery of Buddha images and wall and ceiling paintings not seen anywhere else on the Island.